Welcome to the Church of St John the Evangelist. Located in the heart of Canada's capital, St John's is an active downtown parish with roots going back well over a century. In 1853, the Duke of Newcastle, in a letter to the Earl of Elgin (then Governor-General of the Canadas), deeded a piece of land on the corner of Sussex Drive and Mackenzie Street for the construction of a chapel for Anglican soldiers stationed in Bytown. In 1861, a small school and “chapel of ease” was built, under the direction of the parish of Christ Church. Dr. Lauder was the first Incumbent of this house of God. By 1871, the chapel of ease was named St John’s and Bishop John Lewis wished to establish it as the pro-cathedral of the Diocese of Ontario. St John’s soon became known as The Bishop’s Chapel, a name it was to have until 1874. In that year, when the congregation of “goodly and godly” people was sufficiently large, the Parish Church of St John the Evangelist was consecrated and the Reverend H. Pollard was installed as the first Rector. In 1889, a furore erupted in St George’s Church which was to have a dramatic effect upon the life of St John’s. 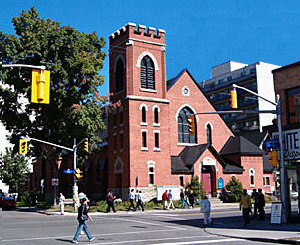 A small core of thirty people left St George’s over a dispute centering on the liturgy, and this group bought a piece of land at the corner of Elgin and Somerset Streets from James McLaren of Buckingham, Quebec. Mr. J. Hames was hired as the architect and construction began on a new Anglican church. The total agreed cost of the new church was $20,000 and the cornerstone was laid on October 21, 1890. Within three months, a small congregation was worshiping in the unfinished structure. The first baptism was held on May 15, 1890, when the Rector, John Gorman, christened his son, John. At the annual Vestry of 1891, Father Gorman agreed not to tamper with either the theology or the liturgy of the parish without a two-thirds agreement from the parish. In March, 1891, the church was completed and consecrated as Grace Church. At this time, St John’s (Sussex Drive) established a small mission church in Lowertown and this was known as St Augustine's, Anglesea Square. The church and property were sold in 1921 and the mission was soon demolished. In 1907, the federal government offered to purchase St John’s in order to erect new government buildings. 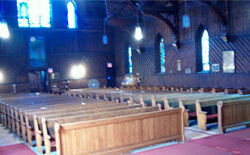 The people continued to worship at St John’s until January 12, 1912, when fire destroyed the building. After the fire, it was suggested that St John’s join with St Luke’s (Somerset Street), an idea which did not appeal to either congregation. 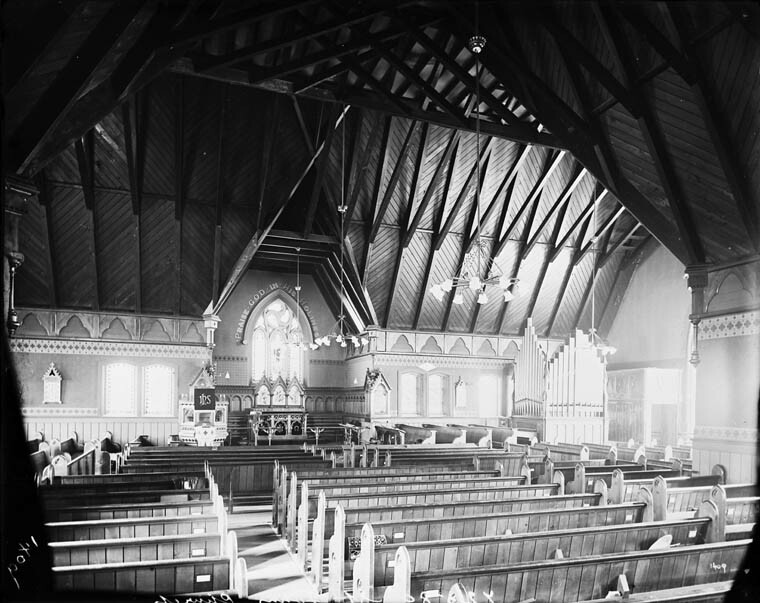 A union was then proposed between St John’s and Grace Church, and on November 3, 1913, a new parish was constituted by Vestry and became known as St John the Evangelist Church. The Reverend J. Gorman was Rector, assisted by Canon Pollard as Rector Emeritus. The interior construction of the building is unique in that it is entirely of wood, although the outer walls are stone and brick. The sombre interior of the church accentuates the beauty of the many stained-glass windows. Above the Elgin Street entrance is the Ascension window. It complements the window above the main altar which depicts the life of Christ. Each of the windows in the church has been given by parishioners as a thankoffering and they range in age from the Angel (1891) right up to 1990. Each speaks of the mystery and joy of Christ and of our commissioning to be Christ's ministers and disciples. The organ, located in the northeast corner of the church, was built in 1977 by Gabriel Kney of London, Ontario. It contains some 2,000 hand-made pipes, including a unique rank of fanfare trumpets which project horizontally into the church. The area beside the organ is believed to have been the original chapel of the church. This area is now mainly used for choral and instrumental presentations. The Memorial Chapel, completed in 1950 on the site of the old parish tennis courts, stands as a memorial to those of this parish who died in the wars of this century. It is a “quiet and lonely place” for meditation and prayer and is used during the week for small group worship. In 2009 the nave underwent extensive renovation; the choir was moved from the chancel to the nave, a second organ was installed, and a nave altar was added, from the former Church of St John the Baptist, Pierce's Corners (consecrated 1892, deconsecrated 2008). St John’s is both a house of prayer and a house filled with activity. We believe that we are called by God to serve Christ through both work and prayer, and thus we strive to be a community dedicated to God and to one another, in service and in fellowship in and though Christ. Throughout the years, St John’s has been an active member of the Centretown community, from meetings of Alcoholics Anonymous to the annual Art Credo, from concerts to political meetings. St John’s has been an active and concerned member of the community and the city.